As a wedding planner in Chicago, I get asked a lot if it’s true that you can save money by designing your event around “in season” floral. The vast majority of special event flowers are grown year-round on farms in South America, Holland and Thailand – and much of the time it’s very cost effective to use these blooms because of the large volume of product that these mammoth farms produce. BUT… if you don’t have to fly flowers in from the 4 corners of the earth it can be better for the pocket book and most definitely is better for the environment (all that jumbo jet fuel takes its toll on Mother Earth!). There is also the argument that using in-season blooms adds authenticity to your event design. The main advantage of choosing in-season floral really doesn’t have to do with cost though… It’s that flowers tend to be bigger, fuller and more spectacular if you can get the blooms locally in season. Then – there are the elusive flowers that are ONLY available certain times of year… Here are a few of our favorite reasons to plan a wedding in SPRING! Nothing says “spring” after a long winter better than the first buds of green on local trees. My birthday is in late April, and the magnolia tree down the block always seems to be wishing me a “Happy Birthday” right on schedule! Some of the most coveted looks in event design involve these GORGEOUS blooms! They are elusive and absolutely ONLY available in spring – most of the time in April in the Midwest. Cherry blossom, magnolia, forsythia and lilac are all exclusively the domain of the spring bride. But beware! Changing weather patterns and seasonal warm and cold snaps make these tough to predict. Getting your heart set on flowering branches can be a major bummer. In the spring of 2012 the early seasonal warmth meant that most flowering branches were completely done by the end of March. Tulips, hyacinth, daffodil – Oh my! Does anything make you more hopeful than a daffodil poking through the last mounds of dirty snow in your front yard? And the smell of hyacinth incorporated into a centerpiece is a feast for the nose as well as the eyes! Tulips come over from Holland year round, but they are especially cost effective in the spring when most wholesalers are offering specials on them. Fun fact – did you know that tulips continue to grow even after they are cut? Beware the centerpiece that looks balanced in the morning and has grown toward the afternoon sun looking happily lopsided by the afternoon! Incorporating these flowers still potted is a great opportunity to let your guests take home a lasting piece of your wedding décor. Ahhhhh, the peony. Arguably the queen of all wedding flowers, is there a bride that doesn’t love a peony whether in crisp fluffy white or rich deep raspberry? One of my personal favorites is the coral charm peony – it’s delicate peach petals and cheerful yellow center are gorgeous in almost any type of arrangement. Peonies start coming in from Europe as early as December, but I have many a bride that plans her May wedding specifically to incorporate this favorite flower. Although they can be very expensive – they are also really big and beautiful so you don’t need a lot of them in a centerpiece to make a statement. 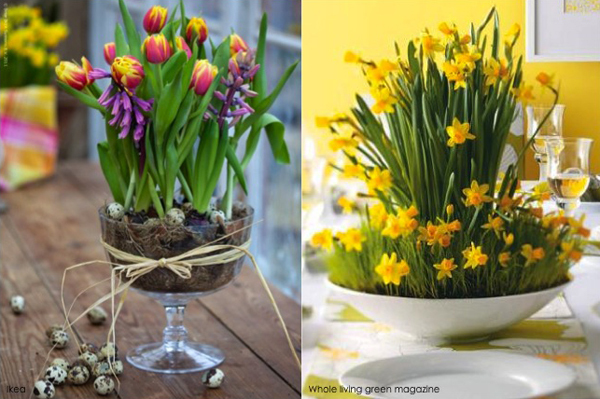 Check out all our spring flower favorites on our Pinterest Board!